nor all logic, but it is somewhat beauty and poetry...."
A Montessori classroom offers many opportunities for young children to expand their knowledge during the years when they are motivated by spontaneous interest. The large wooden puzzle maps are among the most popular activities in the classroom. The child can put each puzzle piece into place by means of a little knob on its flat, shiny surface. The introductory map of the world has a separate puzzle piece for each continent. 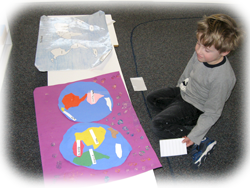 After working with the world map, the child can do one of six puzzle maps of continents in which each country is represented by a separate puzzle piece. Finally, there is a map of the United States with a separate piece for each state. At first the children use the maps simply as puzzles. Gradually they learn the names of many of the countries as well as information about climate and products. The maps illustrate many geographical facts concretely. The children can see the great size of Russia and the positions of Great Britain, Japan and Iceland as islands. The children make the common land formations - - island, peninsula, and isthmus - - with floral clay and set them in pans that are painted blue. Then they pour the water around the island, on three sides of the peninsula, and on both sides of the isthmus. In three other pans they make the land which surrounds the lake and which borders the gulf and the strait. Then they pour water into the pans to actually form these bodies of water. They often put miniature trees or houses on the land and little boats on the water. As a follow-up, they locate similar bodies of land and water on a large map. Many Montessori classrooms have beautiful sets of nature cards which illustrate in color such information as the parts of a tree, the parts of a leaf or the parts of a flower. The children match these illustrations with the corresponding names. Working with these cards helps the youngsters to become more observant of the characteristics of things which grow in their own environments. They frequently have plants, flowers, or vegetables growing in the classroom; or they bring in samples which they can coordinate with the illustrations on the cards. 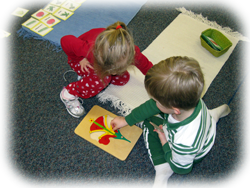 Montessori offers the children a concrete presentation of history by letting them work with a Time Line. A Time Line is a very long paper which can be unrolled and stretched along the floor of the classroom. The line is marked off in segments which represent consecutive periods of history. To perform the exercise, children select pictures or cards representing historical events and place them in sequence on the Time Line. As an introduction to the idea of history, the children sometimes begin by making a little time line of their own lives starting with baby pictures. Time Lines can also be made for certain phases of history such as the development of transportation.